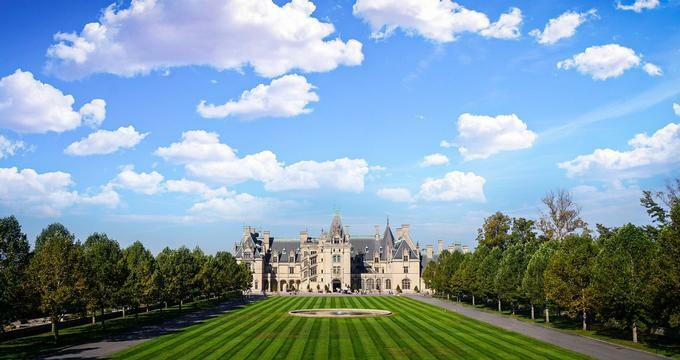 Biltmore Estate is a beautiful Chateauesque-styled private estate and popular tourist attraction in Asheville. Owned by the Vanderbilt family, the mansion and its spectacular gardens were built between 1889 and 1895 by George Washington Vanderbilt and is currently the largest privately owned house in the United States. The regal estate, which is one of the most prominent remaining examples of the Gilded Age, can be explored on a variety of self-guided or guided tours, including a breathtaking rooftop tour, which offers unbelievable views, and a stroll through the magnificently manicured gardens. After making regular visits to his mother in Asheville, George Washington Vanderbilt II decided to build own summer estate in the area. Completed in 1895, at the height of the Gilded Age, George Washington Vanderbilt II named his estate Biltmore (‘Bildt’ from the Vanderbilt's ancestors' place of origin in Holland and ‘more’ meaning open rolling land). Vanderbilt opened his spectacular estate on Christmas Eve 1895 to family and friends who were encouraged to pursue leisure and country pursuits. After changing hands through several generations, the Biltmore Estate was designated as a National Historic Landmark in 1963 and became a managed company in 1995. The Estate and its various components, such as the Biltmore Estate Wine Company, the Inn on Biltmore Estate, the Antler Hill Village, and the Village Hotel on Biltmore Estate opened to the public and remains one of the most popular tourist attractions in the country. The luxurious family home of George and Edith Vanderbilt is truly a wonder of architecture and hospitality, spanning three floors filled with vintage clothing, elegant furnishings accessories, and original works of art by Pierre-Auguste Renoir and John Singer Sargent. Walls are adorned with magnificent 16th-century tapestries; a grand banquet hall boasts a 70-foot ceiling and peaceful library houses over 10,000 volumes. The estate also features an indoor swimming pool, a bowling alley, and no less than 65 fireplaces around the mansion. Designed by America’s foremost landscape architect Frederick Law Olmsted (of Central Park fame), the formal and informal gardens of the Biltmore Estate echo the grand elegance of the mansion with a variety of different landscapes, ranging from stylish Italian Gardens to the lush Biltmore Forest. A living tribute to Olmsted’s genius, the gardens feature a traditional Rose Garden with more than 250 varieties of roses, a century-old model for forest conservation, open meadows of Deer Park, and a rustic three-mile walking trail along the French Broad River. Olmsted incorporated two Victorian water features in the gardens – the tranquil Lagoon and Bass Pond created from an old creek-fed millpond – each of which was used for recreational activities such as fishing and rowing. Designed to replicate the working estates of Europe, Biltmore Estate is home to Antler Hill Village, which boasts architecturally compatible buildings, including a church, a post office, shops and a school and picturesque landscaping. Established as a point of access to the train station and the estate, the Village has grown into an entity of its own with various farming and scientific forestry programs used on the estate grounds. The Barn in Antler Hill Village offers guests the opportunity to step into the everyday lives of families who lived on the property tending crops, raising livestock, and working at Biltmore Dairy in the 1890s. Here, visitors can watch craft demonstrations, blacksmiths and woodworkers at work, and purchase unique American-made arts and crafts items, hearty snacks and more. The Farmyard presents children with turn-of-the-century games and the chance to interact with farm-friendly animals. The Outdoor Adventure Center in Antler Hill Village offers an array of outdoor activities for all ages from biking and kayaking to trail rides and Land Rover expeditions. Nestled in the Blue Ridge Mountains of Asheville in the heart of Antler Hill Village, Biltmore’s 8,000-acre estate is also home to a historic winery. Visitors can enjoy specialty tastings of more than 20 handcrafted wines, as well as reserve and sparkling wines by the glass from the wine bar accompanied by delicious cheeses and locally-made truffles. Specialty tours and tastings include Red Wine & Chocolate Pairing, Wine & Cheese Hours, and exclusive Vine to Wine Tours. Biltmore Estate is open 365 days a year and hours vary according to the season. Guided tours of the house and the gardens are available by reservation.